Bank Of Innovation is committed to delivering superior products for your promising digital life at affordable price. Our return policy is really simple: Tell us you dont want it, we refund your payment immediately. And we will take care of returning the product. We strive to deliver 5-star customer service, please remember that all issues can be resolved without leaving a negative/neutral feedback or opening a dispute, please just contact us and we will make you a fully satisfied customer. Warranty: 18 Month Full Warranty. Within 18 month, if there is anything wrong with the product, please contact us, we will refund your payment or send you a new product. Super Fast Charging: It is the world's first of its kind to charge Macbook with a max current range of full 4.3 Amps. This is the highest charging speed Apple applies for the new MacBook and is double the speed of most other similar cables on the market. it can charge your Macbook's battery from 0% battery to 100% battery within 1 and half hour. (only with the original Apple 87W power adapter that come with your laptop). 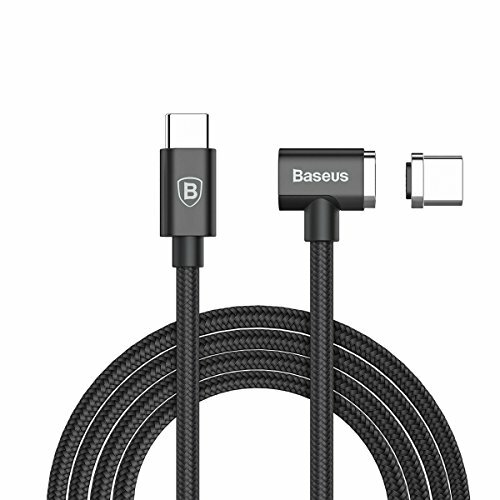 Ultra-Durable: Lasts 5X longer than other USB cables. Aramid fiber reinforcement and makes it stronger and more robust. inside 19 premium quality wires with high density metallic shield is designed to withstand every day wear and tear. Detachable Magnetic Connector: Easier to snap on, reducing abrasion during inserting or pulling out the cable, help to extend lifespan both your USB cable and computer USB C port. Compatibility: MacBook Pro 2017 & 2016, MacBook 2017 & 2016, or other USB C device that support 4.3A fast Charging. 18 Month Longest Warranty With 45 Days Free Return: We are confident enough for our product quality so we offer you 18 month longest warranty in the market, What is more, You can return it within 45 days of receipt without paying any returning postage cost. Cable Lenght:1.5m. If you have any questions about this product by Bank-Of-Innovation, contact us by completing and submitting the form below. If you are looking for a specif part number, please include it with your message.